The G Series hammermills are impact reduction crushers designed for material no harder than a medium hard limestone (Mohs hardness of 5). 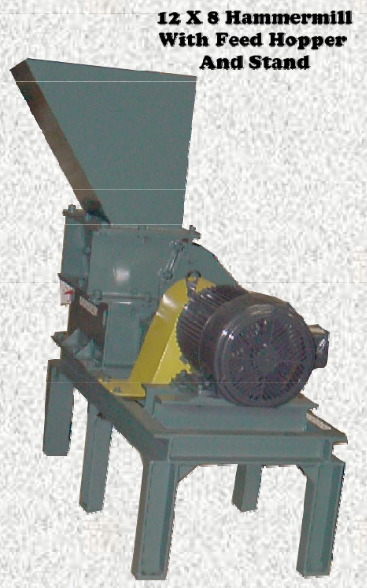 These hammermills feature heavy frame and housings, abrasive resistant liners, anti-friction bearings, doors for easy inspection of internal parts, easily replaceable hammers, easily replaceable discharge screens, and a variety of hammer types and screen sizes, with screen sizes down to 1/16 inch openings. Capacities shown are based upon 3 inch feed and product 100% -4 mesh. Optional equipment includes steel beam mounting base, motor, drive, guards, stand and hopper. Equipment is coated with primer and painted with one coat of enamel. (5) Rotor with hammers removed. Note the bearing housings set well out from rotor and well removed from grinding chamber. Hot material can be readily handled. (6) Rigid hammer rotor with 6 point hammers. G-Series Hammermills feature LOCK DISC MOUNTING of hammer pins, bolts and rods gives you many advantages, prevents end play, prevents hammer end wear of pins, prevents damage to the housing (from broken cotters and worn pin nuts), allows replacements and changes to be made in 1/10th the time. For dust control, approximately 250 CFM of air is required. Capacities based on 3” feed, -4 mesh product. Maximum Particle size for crushers is 4 inches.